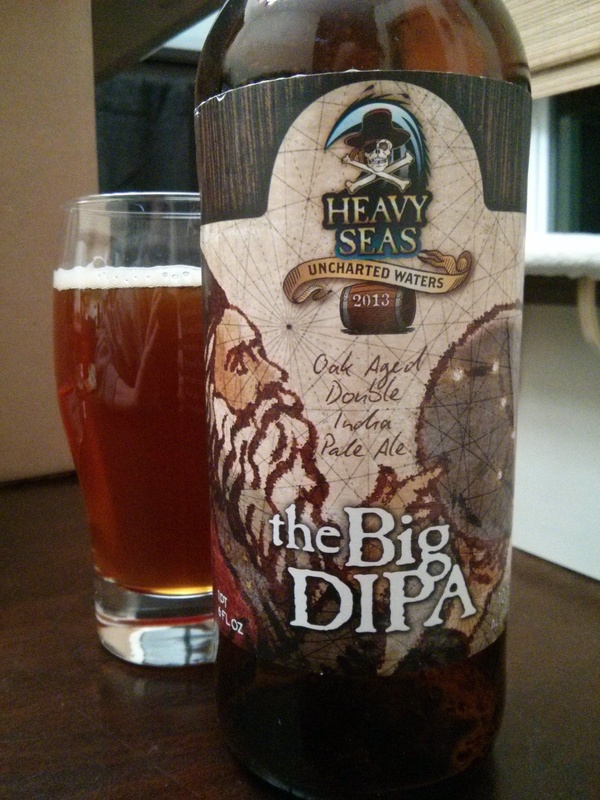 The Big DIPA by Heavy Seas is an oak-aged double IPA under their Uncharted Waters series. The beer poured a slightly cloudy amber with a foamy white head which stuck around for a little while. Initial smell is that of oak and alcohol, which is to be expected on a 10.5% ABV beer. After second whiff I got dried fruits and bread crust. First sip is quite sweet, tasting mostly of malts and caramel. As you let it sit on your tongue for a second you get the oak-aged qualities alongside the bitter hops towards the end. You get hints of pine and small amounts of fruit from the hops. Once you begin to swallow you get the burst of alcohol from this high ABV beer. The beer is an easy-drinker and the booziness of it can easily catch up to you. Big DIPA is a heavily malt and hop-forward beer, but it balances both of those out quite nicely. While Heavy Seas does not distribute to the Mid-West nor West Coast, if you have a chance I do recommend seeking them out if only for this beer. It was delicious and definitely worth a try.